One of my family's favorite meals is chicken pot pie. 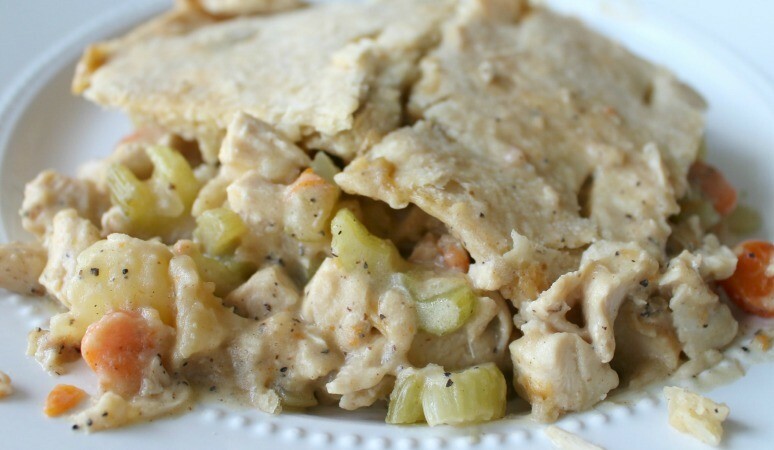 It is chock full of yummy veggies, seasoned chicken and a flaky, homemade crust. It is so delicious and a regular on the weekly menu around here. Mix salt, pepper and garlic powder together and sprinkle on chicken. Combine soup and sour cream and pour over chicken. Bake at 370 degrees for 1 hour. While the chicken is baking, sauté vegetables in butter for about 18 minutes. To the water add the flour and stir. Add the water/flour mixture to the vegetables and stir until slightly thickened, then remove from heat. Combine with chicken and sauce. Pour in 9x13 baking dish. Cut shortening into flour and salt. Cut to shape of pan and cover pie, making slits to vent the steam. Cook on 425 degrees, until brown bubbly. Usually 30-45 minutes.